Latinos are still an important source of workers to the U.S. economy. However, this growth is now led more by native-born Hispanics and less by immigrant workers. The growth in the working-age population of foreign-born Latinos has leveled off. Moreover, the growth in the number of immigrant Latinos in the U.S. labor force from the third quarter of 2007 to the third quarter of 2008 was less than in the recent past. But the extent to which this slowdown is due to an increased outflow of migrants is not clear. Passel and Cohn (2008) found a decrease in the annual flow of undocumented migrants to the U.S. Most of those migrants are from Latin American countries. The Latino working-age population continues to grow at a faster rate than average. From the third quarter of 2007 to the third quarter of 2008, the total working-age population in the U.S. increased by 2.6 million, or 1.1% (Table 1). The Hispanic working-age population increased by 1.1 million, or 3.5%. Thus, Latinos remain a significant source of workers to the U.S. economy. They accounted for 41.7% of the total increase in the working-age population from the third quarter of 2007 to the third quarter of 2008. That is much higher than the current share of Latinos in the U.S. working-age population — 32.3 million out of 234.1 million, or 13.8%. The total growth in the labor force kept pace with the growth in the working-age population. From the third quarter of 2007 to the third quarter of 2008, an additional 2.0 million workers streamed into the labor market (Table 1). That kept the labor force participation rate virtually unchanged — 66.6% in the third quarter of 2008 compared with 66.5% in the third quarter of 2007. However, the growth in the Latino labor force lagged behind the growth in the working-age population. Latinos added 614,000 workers to the labor force from the third quarter of 2007 to the third quarter of 2008. That was an increase of 2.8%, less than the increase of 3.5% in the Hispanic working-age population. 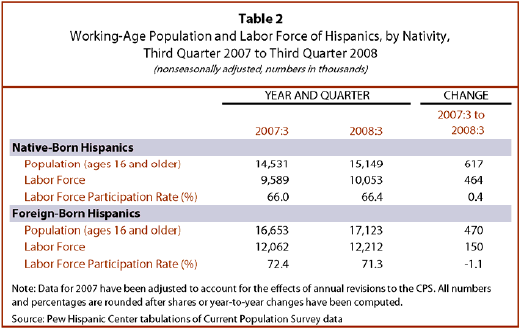 Thus, the Latino labor force participation rate fell from 69.4% in the third quarter of 2007 to 69.0% in the third quarter of 2008. But that decline is not statistically significant, implying that labor force participation among all Latinos may have held steady in the first year of the recession. One cannot conclude from these labor market trends that foreign-born Latinos are returning to their countries of origin due to the recession. The exact cause of the slowdown in the growth of the working-age immigrant population is not clear. Research by Passel and Cohn (2008) suggests that slower growth in the Latino immigrant working-age population is partly associated with reduced inflows of undocumented migrants since 2005. However, the role played by increased outflows of workers is not known. Foreign-born Latinos, however, appear to be withdrawing from the labor force in the face of the recession. From the third quarter of 2007 to the third quarter of 2008 only 150,000 foreign-born Latinos are estimated to have entered the labor force (Table 2). That change is not statistically significant, meaning there is a 90% chance the estimated change lies within a range that encompasses zero. The virtual lack of growth in the Hispanic foreign-born labor force contrasted with the relatively steady growth in the working-age population. Therefore, the labor force participation rate for foreign-born Latinos fell from 72.4% in the third quarter of 2007 to 71.3% in the third quarter of 2008, a statistically significant drop of 1.1 percentage points (Table 2). This means that, relative to the size of their population, fewer immigrant Latino workers were either employed or actively seeking work in the third quarter of 2008 compared with a year ago. Immigrants from Mexico also entered the labor force in reduced numbers between the third quarters of 2007 and 2008. In particular, the Mexican-born labor force increased by 225,000 workers in that one-year period (Table 3). But this growth was less than the 404,000 Mexican-born workers who entered the labor force in 2007 (Kochhar, 2008). It also did not keep pace with the increase in the Mexican-born working-age population. Consequently, there was a significant decline in the labor force participation rate for Mexican-born workers — from 72.7% in the third quarter of 2007 to 70.7% in the third quarter of 2008. Immigrants from Central or South America did not register an increase in either their working-age population or their labor force from the third quarter of 2007 to the third quarter of 2008. Estimates suggest a decline in the immigrant workforce from South America, but it is not a statistically significant change. The overall lack of growth in the foreign-born Hispanics labor force is driven by declining numbers of those who entered the U.S. between 1990 and 1999 (Table 4). From the third quarter of 2007 to the third quarter of 2008, the size of this labor force decreased by 217,000, a statistically significant decline. That is roughly the same as the change in the working-age population of this group of immigrants. This population can change for one of two reasons — deaths or departures from the U.S. Therefore, these trends suggest that at least some foreign-born Latinos are not only leaving the labor force but, perhaps, also returning to their countries of origin.